Funny how you can experience a splendid multi-course meal with all its nuances and textures and then end up rhapsodizing about the tiniest dab of a condiment as the pinnacle of that meal. Or maybe it’s just me. That’s exactly how I feel about the mere dabs of crimson kimchi puree chef Matt Lake and his crew developed for a seared tuna appetizer on Zy’s latest menu. The dish consists of a few medallions of delicate seared tuna and a small stack of blue crab set atop a pool of silky green chili tofu puree. Drizzled over all is a hint of lemon syrup. To the sides, the kimchi paste, or puree, adds its come-hither, deep red color. With one little taste, it delivers a spicy, tangy mélange of flavor that resonates as it makes you wonder just what’s going on here. Altogether, these ingredients make brilliant music together. I could have eaten that appetizer twice, right then and there. 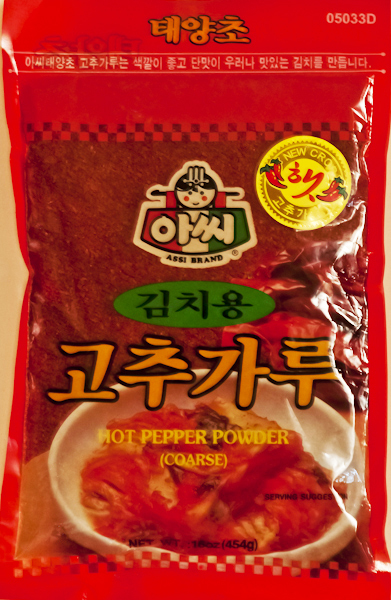 Forget the cabbage that traditionally completes Korean kimchi. In this instance, the spicy paste is all you want or need. Long after our dinner at Zy, the impression of this truly original small plate presentation lingered. I had to have the recipe. Matt kindly shared it -- and a little background about how the idea evolved in his kitchen: “One of my line cooks wanted to play with kimchi, so we were making a few variations. But when I tasted this paste by itself, I thought it was pretty cool. So we refined it a little. I then thought of the tuna plate. We worked on the composed dish, building it around this paste. I thought it would be interesting play off the tuna and the green chili tofu for the brightness, and the crab to help enrich the tuna.” Yep. It worked. 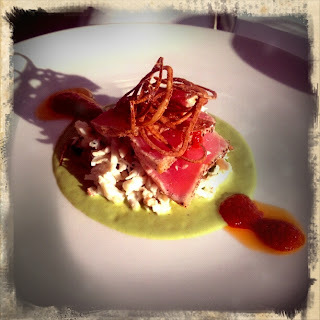 And, restaurant manager Miles Broadhead’s suggestion that we pair the tuna appetizer with a glass of the floral Boutari Moschofilero, a lovely Greek white wine, was spot on. Chef Matthew Lake recommends Assi brand chili flakes. I found this consumer-sized bag at the Oriental Food Market at 667 South 700 East in Salt Lake for about $4. At home, you might just enjoy this brilliant paste with your own sushi grade tuna, or as a counterpoint to some fresh crab, or both. Combine all ingredients in a blender and puree until smooth. Season with salt to taste, place in an airtight container and refrigerate overnight to allow flavors to develop. Matt shared the recipe for the entire dish, but I’m just posting the paste. If you want the full recipe, including the green chili tofu puree and lemon syrup, I’d be happy to share it. Just leave a comment with your email address. Chef Lake is a culinary genius, and I love his creative take on food. Every plate I've ever had there was phenomenal. I'd love the whole recipe! You've got it! Sending today.